Each box comes with a card detailing the month’s products and brands. The theme this month is “Connect” and the box was curated by featured blogger, Lindsay Satmary. I had to admit that I was a little confused about why I received a set of stamps this month, but after reading the description on the info card I understood! These are designed by Anna Bond from Rifle Paper Co. and go along with the included Rifle Paper Co. greeting card. Both are beautiful designs (as is anything from Rifle Paper Co.) and it’s always nice to have cards and stamps on hand! They also fit very well with the connect theme! These gold chevron and rose quartz beads are attached to a delicate 14k gold filled chain. The chevron design with the pink beads is very playful to me, but the chain is a little shorter than I normally like. It is described as a layering necklace so I’ll have to see if I can find some other necklaces to pair it with. According to their site, this might be an exclusive design for Mommy Mailbox. They describe it as a “heart chakra inspiring necklace” with the rose quartz being said to open the heart chakras to healing and unconditional love. I was wondering how this fits into the theme, and I think this is a sweet interpretation of connecting with your loved ones. I have never heard of a Stroopwafel before, but it was really delicious! It is a traditional Dutch breakfast that you set on top of your hot tea or coffee to let the steam melt the caramel inside before you eat it. The outer layers are two very thin waffles. I set mine on top of my tea, but I guess my rim was too wide because once it warmed up, it folded up a bit and fell into my tea! So the caramel was not quite as melted as it probably should have been, but it was still a sweet, chewy and very unique treat for me. They also included a coupon for the Gourmet Wedding Gifts site. It looks like these stroopwafels also come in various chocolatey flavors! Yum! These cute little baking cups were a nice addition to the box considering the next item. I use cupcake liners frequently when baking so it’s great to have some extras on hand! I think it would have been fun to receive a recipe to go along with these. This apron is very nicely made and is designed by artist Molly Hatch. There were several different patterns that subscribers may receive. I was secretly hoping for the ladybug one when I saw the spoilers since it’s a nickname for my daughter, but this Tea Garden design is a little more grown up and very pretty. The cornflower/denim blue is a nice color and the design feels very feminine to me. You can see the apron isn’t too long (please excuse the messy kitchen!) and it’s actually a thick fabric so it will work well to protect clothing when baking. The front has two little pockets as well which will come in handy. This too works well with the theme as there’s nothing better than connecting with each other over a meal! Verdict: This month’s Mommy Mailbox theme of Connect was perfect for May and celebrating Mother’s Day. I think everything fits very nicely with the theme and I will use all of these products. While the necklace was a little short on me, I really liked the meaning behind it and I still think it’s a great design! I’m also excited for the incentive to get baking, which is something I enjoy doing. I was also happy to get introduced to a new treat in the stroopwafel. The total retail value of the box this month came to $77.74 and I think this a great value for the $33.95 cost of the box! They’re having a sale on the July box, for $25., offer good 6/14 till midnight only. Use code SUMMER at checkout! I loved this box. I had a great coupon code. The necklace is really pretty. I got the apron that’s gingham. I’d like to swap it for a different print. I ordered this box for Mother’s Day and I quite like it. I adored the apron I received and the lovely necklace. I appreciated the elegant card with the included stamps. The Stroopwafel was delicious with a hot Tea Forte cup of loose tea and I plan on baking this weekend with my daughter some delicious cupcakes. 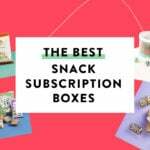 This Mommy box may not be everyone’s cup of tea, but what box truly meets the needs of every subscriber? That is why we have so many sub boxes to choose from.